Leave it to the creator of Game of Thrones to put fans through a shocking twist and quick reversal. According to Entertainment Weekly, George R.R. Martin does watch the television version of his epic fantasy and he can’t remember ever saying otherwise. This vastly contradicts earlier reports that quote Martin as saying he “does not watch Game of Thrones,” because he’s too busy writing. 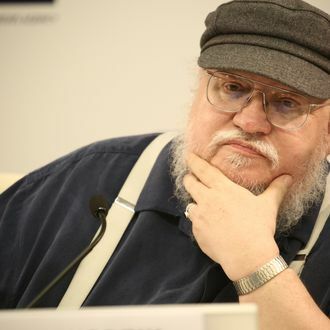 While this bit of false news pleased A Song of Ice and Fire readers hoping to finally get their hands on the much-awaited sixth installment of the book series, it seemed a bit bewildering, considering everybody watches the HBO hit. Martin told EW over email that he had just returned from a convention in Russia and believed that he was either misquoted or something was lost in translation. According to EW, “During his trip abroad he didn’t watch any television — so he’s behind on Thrones’ current seventh season.” Just to reiterate, though, he does, indeed, watch the series. He’s just going to be a bit behind in choosing a side in the Sansa-versus-Arya conflict. And don’t bother asking him for his opinion on Daenerys Targaryen’s majestic winter coat just yet.